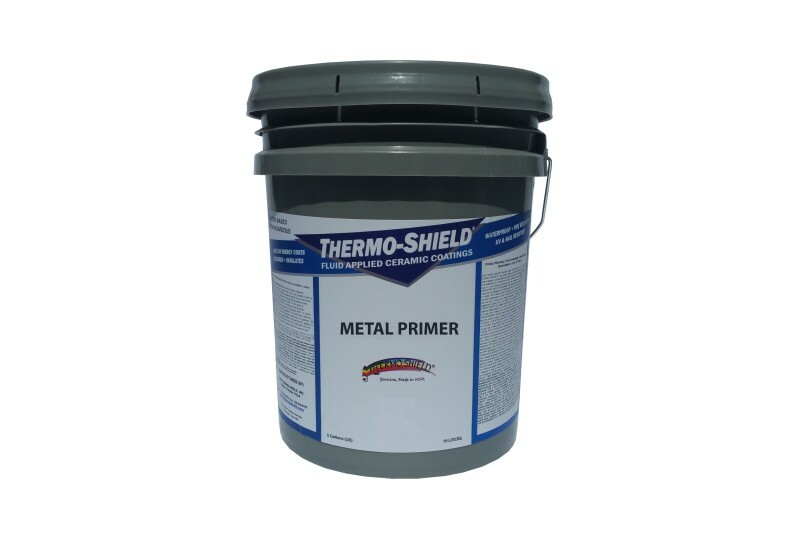 Thermoshield Metal Primer inhibits the spread of rust on metal structures. This corrosion resistant coating is made from 100% acrylic resin, and it is water based, so it is non-toxic. It is used as a primer on metal tanks, pipelines, water tanks, silos, storage bins, metal roofs, beams, and other surfaces that are rusty and susceptible to rust. After the metal primer has been applied and dried, you can begin applying other Thermoshield products such as Tank Shield or Roof Coat. The surface must be clean prior to application. This means that all grease, oil, dirt, loose rust and other foreign substances have to be removed with a washer, sander, grinder or wire brush. The primer can be applied with an airless sprayer, roller or brush. Drying time for the first coat is four hours in normal conditions. Take 24 hours to recoat. Packaging: Thermoshield Metal Primer comes in five gallon (18.9 liter) pails or 55 gallon (208 liter) drums.